The centre acts as a hub for innovation, networking among practice experts and the general promotion of adopting Building Information Modelling (BIM) principals. This is an approach to managing and planning every aspect of design and operation in the construction process in a better, more efficient way to improve the basis upon which the construction industry and its clients operate. 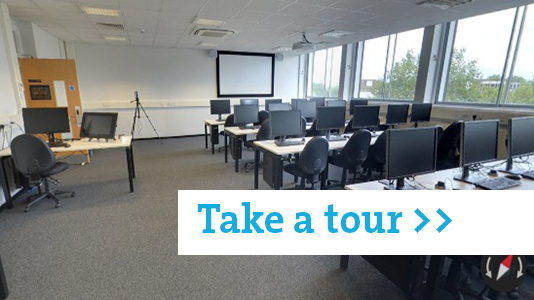 Take a virtual tour of the BIM Centre computer lab. The government says public sector construction projects are too expensive and pressure is on the industry and its supply chain to cut capital procurement costs by a radical 20%. Existing methods need to be reconsidered in order to transform and streamline how construction projects are managed and delivered. One of the underlying problems that make building projects so wasteful is poor coordination. On average, only 20% or less of the costs of a new building are capital costs such as design and construction. This is compared to 80% or more of costs going towards owning and operating the building through the building's life cycle such as running it and heating it. So after making a 20% saving on capital expenditure, further down the line the government will look at making savings in the owner and operation costs too. Having been adopted by a number of private sector clients including ASDA and John Lewis, the Cabinet Office published the Government Construction Strategy in 2011. This announced the government's intention to require collaborative BIM on all its projects by 2016. Mandating BIM aims to streamline the process of capital project delivery, ensuring that planning of all processes are mapped out in advance. The key to improved efficiency is the widespread take up of BIM. The problem now is ensuring BIM is implemented in a consistent way across this vast and complex industry, where BIM guidelines are interpreted in many different and sometimes conflicting ways. LSBU's solution has been to set up an in-house BIM Centre whose purpose is to offer a source of information and guidance on best practice to support projects and improve consistency. The project was conceived in December 2011 together with the formation of the BIM Academic Forum (BAF), a collaborative group with a mission to enhance and promote the teaching, learning and research aspects of BIM. The initiative is overseen by the School of The Built Environment and Architecture. The function of the BIM centre, according to senior lecturer Steve Pittard, is to provide a catalyst for innovation, something which people can use for networking, ideas and to adopt BIM. At the moment, he says, "No two people see BIM in exactly the same way; different people have different definitions and this is a problem." So far, the BIM Centre at LSBU has been used for events, training and extracurricular modules for undergraduate students. With the BIM Centre at its disposal, LSBU is superbly positioned to affect future employability – especially as work experience and real-life projects will be included in all courses. Informed modules are helping to produce BIM-capable graduates who can challenge traditional practices and become problem solvers. LSBU students now analyse BIM applications in major London developments. Past projects include proposing alternative implementation plans for the skyscraper at Leadenhall nicknamed the Cheesegrater. This applied work cultivates the knowledge and confidence needed to mold future industry experts: "The experience here is invaluable. It's our first chance to work on a real project – to see how it's going to work in the real world, on a real building."